With the new tool, farmers can look at real-time maps that feature data like "acres of corn harvested for grain." The U.S. Department of Agriculture’s National Agricultural Statistics Service announced on Oct. 27 that it now offers the Ag Census Web Maps application to farmers. The app is an online tool that gives users access to Census of Agriculture maps and data about plants, livestock, animals and other agricultural factors in more than 3,000 counties across the country. In addition, the app is also interactive. Users can navigate to an area of interest, print the map they desire, display and extract a county’s data, download maps and use the data with common software programs. The service developed the app in collaboration with the USDA’s Economic Research Service. “The Ag Census Web Maps give farmers, ranchers, researchers, planners, nonprofits, and industry easy access to important data that impact nearly every aspect of agriculture,” said NASS Administrator Joseph Reilly. The Census of Agriculture provides a detailed picture of U.S. farms and ranches every five years. 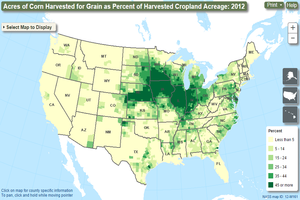 It is the only source of comprehensive agricultural data for every state and county in the U.S. The U.S. Department of Agriculture’s National Agricultural Statistics Service released the 2012 Census of Agriculture on May 29, which profiled all 50 states and Puerto Rico. The census also included data from more than 3,000 counties. Some of the key data points that were covered in the census included general farm statistics, market value of agriculture equipment and products sold, and top crop and livestock items. “NASS is committed to providing timely, accurate and useful statistics and part of that is making data as accessible as possible, including more online resources from the Census of Agriculture than ever before,” said Reilly.